And just like that, Easter is over and the bunny won’t be visiting us for another year. This truly tragic news has my boys, okay, mostly my toddler extremely distraught this morning. And in un-related to Easter news, I’m preparing you for summer with this recipe today because you all know I notoriously share recipes way before you’ll actually want to use them. ? Today we have a fun mash-up of two super popular dinner recipes on this site. 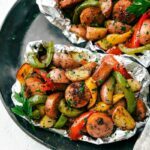 Since you all have loved this Italian sheet pan sausage and veggies and raved over these tin foil sausage and veggie packs, I thought it was time to combine them into a seriously simple, delicious, & healthy dinner: Tin Foil Italian Sausage and Veggies! Stovetop: throw the entire mixture into a large dutch oven (or half of the mixture into a large skillet) over medium-high heat. Stir occasionally until the veggies are crisp tender (about 12-15 minutes) adding in additional olive oil as needed. Oven (no foil): grab a large sheet pan and line it with foil OR parchment paper so that none of the tray is exposed. Pour the entire mixture over it and bake at 425 degrees F for about 30-35 minutes, flipping the ingredients around once at the halfway mark. Toss that tin foil or parchment paper and cleaning up the tray shouldn’t take more than a minute! Oven (foil packs): separate the mixture evenly into 4-6 sheets of heavy duty foil and wrap them so the foil is completely sealed. 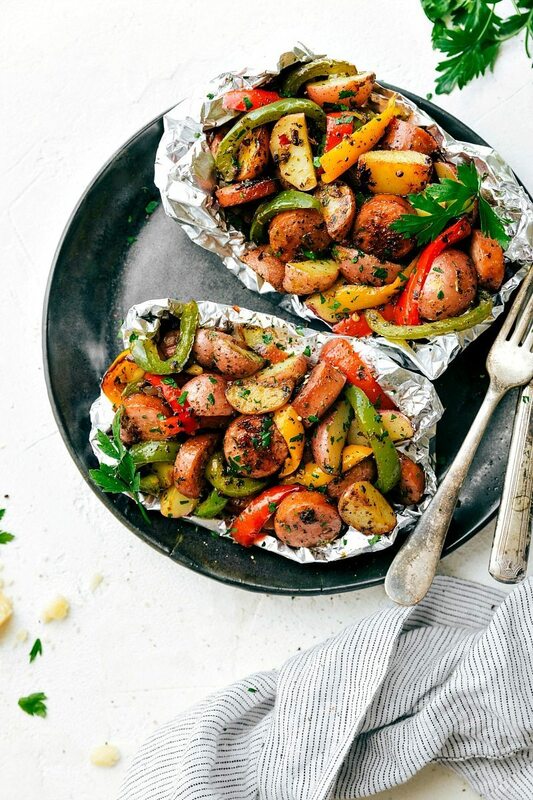 Don’t use more than 1 sheet of foil or these won’t cook properly. 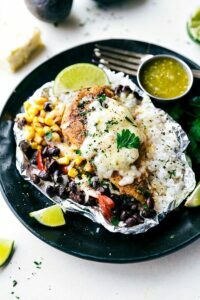 Throw them right in the oven (you can place the foil packs on a sheet pan if you want for easier placement/removal from the oven, but it isn’t necessary) and bake for 30-40 minutes. The time really depends on your preference — at 30 minutes, it’s cooked, but pretty crisp for those that like their veggies a bit more crunchy. At 35 minutes, I’d say everything is “crisp tender” and this is where we like to pull ’em out. For super tender veggies, leave them in 40 minutes! Grill (no foil): If you have a side burner on your grill, grab a large dutch oven skillet and add half of this mixture. Stir it around frequently, adding additional olive oil as needed, until veggies are tender (about 12-15 minutes). Grill (foil packs): separate the mixture evenly into 4-6 sheets of heavy duty foil and wrap them so the foil is completely sealed. Place over a pre-heated grill (medium-high heat) and grill for 25-30 minutes. Make sure to check them at least once at around 10-15 minutes — if they are not pretty tender at this point, your grill needs to be hotter. Flip once in between the grilling process! 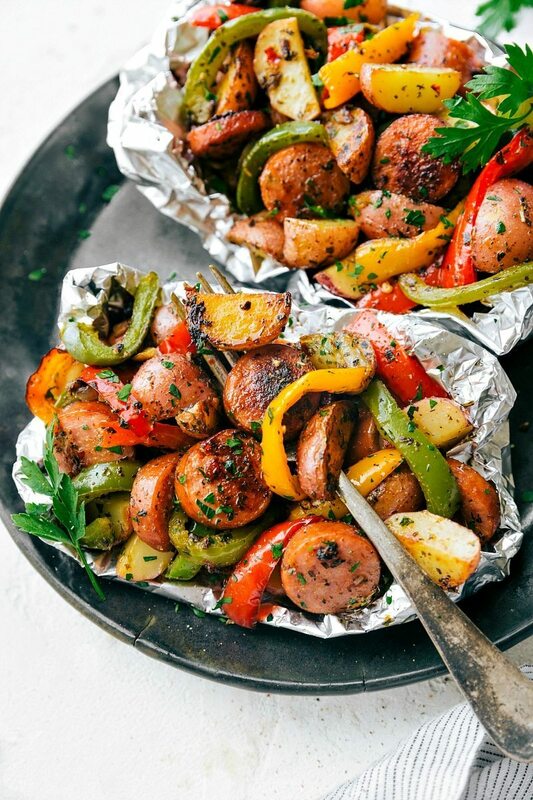 Italian seasoned sausage and veggies made in a foil pack! A great outdoor grill or camping recipe. PLUS instructions to cook this in the stove and without foil! Prep the ingredients: wash and dry the veggies. Coin the sausage. Slice the baby red potatoes in half and then half again. Dice the onion and mushrooms. 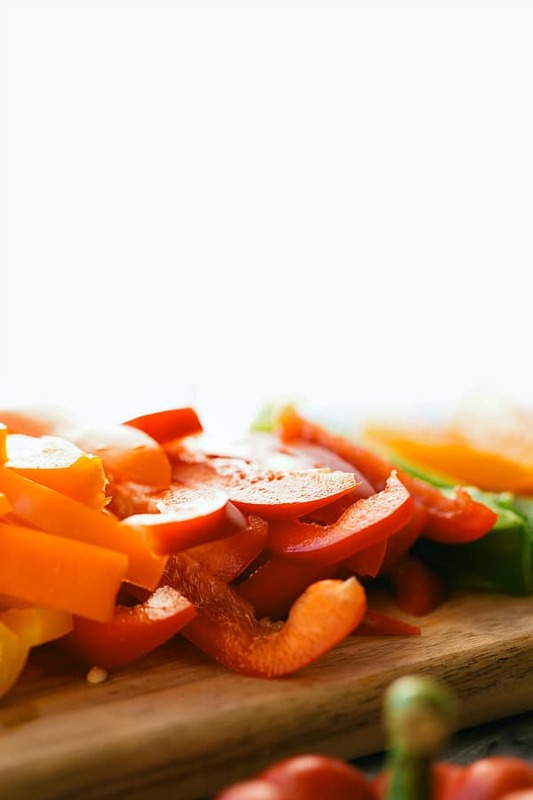 Remove the stem and seeds on the bell peppers and thinly slice. Add the sausage, veggies, and garlic to a large bowl. Toss with the olive oil and all of the seasonings (basil, oregano, parsley, onion powder, thyme, red pepper flakes, and a generous sprinkle of salt + pepper if desired). Toss until well combined. Divide the mixture evenly among the prepared sheets of foil or prepared baking pan. 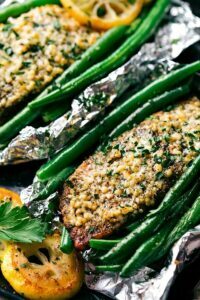 Try to make sure 1 clove of garlic gets into each foil pack (you'll discard the garlic at the end, but it infuses everything with an awesome garlic flavor!) Seal the foil packs tightly so no air escapes, but do not double up foil (only one sheet of foil per pack). Carefully open the foil pack expecting steam to be released. Remove the garlic cloves and discard. Garnish if desired with fresh chopped parsley, any additional salt/pepper, and freshly grated Parmesan cheese. I LOVE roasted veggies on the grill. The addition of spicy sausage…perfect! Looks perfect for lunches! 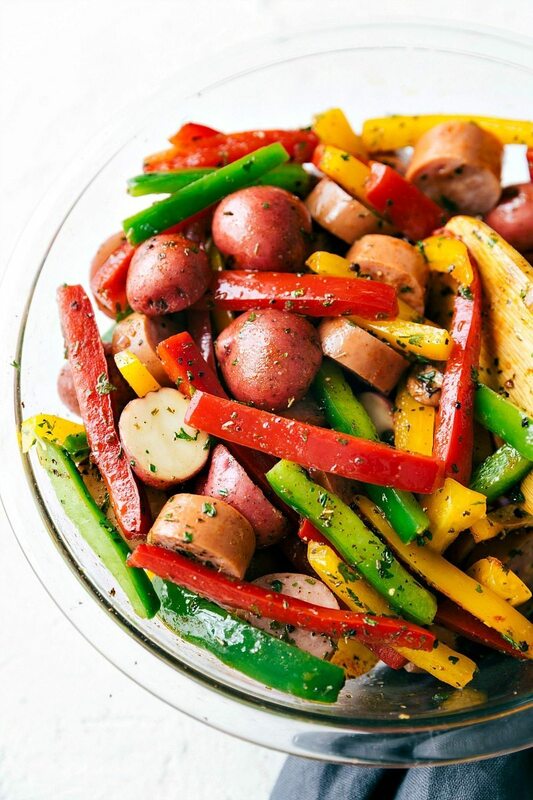 Sausage and veggies are my favorite! I love all the colourful veggies in here. What a great meal! Can you prepare and freeze these (to cook later)? I haven’t tried that so I’m not too sure. I don’t think the veggies would be as crisp though. I tried this over the weekend and it is great!!! My daughter doesn’t like veggies so I just put sausage and potatoes in her packet. She loved it!!! Very flavorful!!! We are going to the beach soon and she asked if we could use the “foil packet” recipe while we are there. Loved it!!! I absolutely love these pretty plates! Do you mind sharing where they’re from? Thank you! 🙂 Speck and Stone! I don’t know if she still sells them; I bought them a couple of years ago. Made this tonight in the foil pack in the oven! Delicious! Even my pickiest loved it. Added just a little more olive oil and garlic. excellent recipe..I ‘tweeked’ it a bit…pan roasted the sausages on stove and parboiled the potatoes, added carrots. 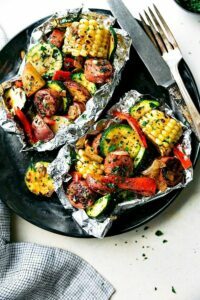 mixed all ingredients in two rectangular aluminum pans covered with thick foil. BBQ for 10 minutes.Stirred and continued cooking for 5 minutes. 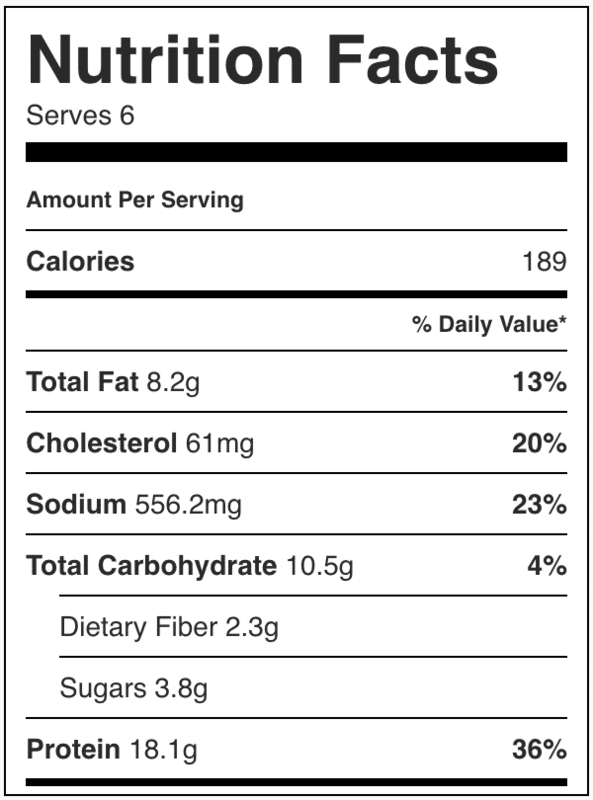 (sprinkled with fresh parmesan cheese),I found it a bit on the dry side. Next time I will deglazed the pan with red wine after frying sausage and wil add l it to the last 5 minutes of cooking. Another winner of yours! I modified the meat and veggie choices for each diner (so easy to make one low carb, or high fat, or whatever). It was a huge hit! Definitely going into the dinner rotation! Is the sausage cooked before going in the packet?